The area around Piazza Navona is known for its charming streets, its beautiful architecture, and its delightful shops. A sense of mystery envelops the area. Therefore, do not be alarmed if you suddenly get off course and lose a sense of where you are. In fact this is to be expected. A few wrong turns will no doubt only allow you to see more of this beautiful area! 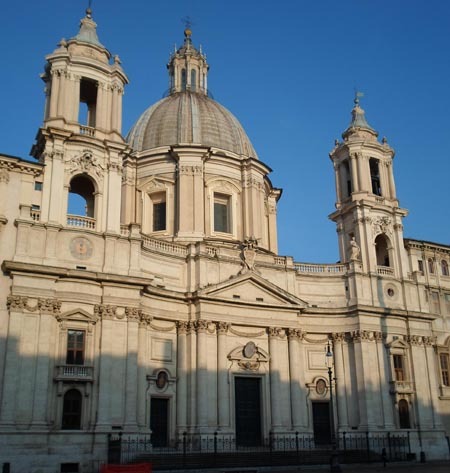 Start your excursion at Sant’Agnese in Agone. From here head south on Via della Cuccagna until you reach San Pantaleo. After visiting this church continue along the busy Corso Vittorio Emanuele until you reach Chiesa Nuova. If you feel confident you can also walk along the more picturesque street of Via del Governo Vecchio to reach Chiesa Nuova. From here cut across as the map indicates until you get to Via dei Coronari and the church of San Salvatore in Lauro. Finally, walk back towards Piazza Navona to visit both Sant’Agostino and San Luigi dei Francesi. The following churches are listed according to the order of the suggested route. The total distance is about 1 mile. To walk will probably take about 2.5 hours when one stops at each of the churches. The churches are generally open from 7AM-1PM and from 4PM-7PM. *According to tradition St Agnes was martyred at this location in 304 AD. A relic of her skull is present in a chapel located to the left of the main sanctuary. *The relics of St Joseph Calasanz (d. 1648) rest under the main altar of this church. His rooms can be visited in the adjacent convent. *St Joseph Calasanz is uniquely known for setting up the first free public school in modern Europe. During his lifetime it was highly controversial to educate the poor. Some thought that it would only leave the poor more dissatisfied with their lowly tasks in society. Education was not seen as an opportunity for advancement. St Joseph Calasanz nevertheless persevered and was eventually appreciated and honored for his work. *The body of St Philip Neri (d. 1595) is enshrined in the left transept. His private rooms can be visited on certain days of the week. They are located in the right wall of the left transept. St Philip Neri spent the last 12 years of his life at Chiesa Nuova. *Some relics of St Padre Pio (d. 1968) are kept within a side chapel in this church. This includes both a vial of blood from his stigmata and a stole. A second chapel contains a small bone fragment from an arm of St Jude the Apostle. *Relics of St Monica (d. 387), the mother of St Augustine, rest within the Blessed Sacrament Chapel just to the left of the main sanctuary. *Also in the first chapel on the left side of the nave is a painting by Caravaggio entitled Madonna dei Pellegrini which means Our Lady of the Pilgrims. *This church is known for its paintings. The most famous being The Calling of St Matthew by Caravaggio located in the Contarelli Chapel. This is the last chapel on the left side of the nave. The other two paintings in this chapel are also attributed to Caravaggio and are entitled The Martyrdom of St Matthew and The Inspiration of St Matthew.